One Yankee's love for history, food & hitting the road. When I was in Fort Myers last summer visiting my cousin Jaime, she introduced me to pretzel bread. I am a lifelong soft pretzel fan, but had never seen it in loaf form, just the usual twists and nuggets. The bread Jaime had was rich and buttery with a golden pretzel “crust” and lots of coarse salt. It was addicting and delicious, and once I had it, I knew I didn’t want to live without it. It took me awhile to get working on a batch myself, but this weekend’s snowstorm gave me the perfect opportunity. 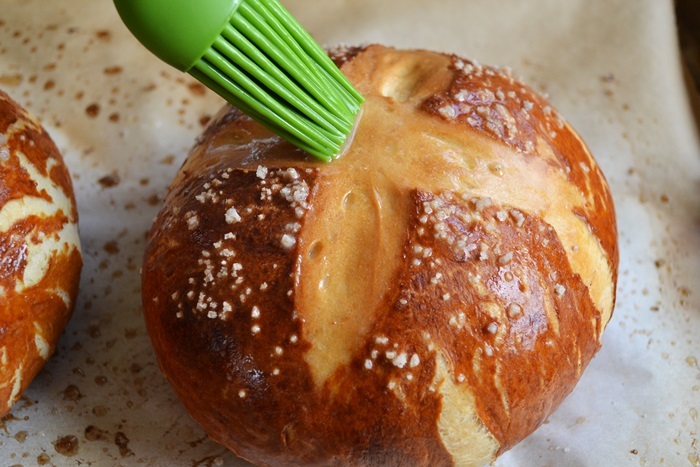 The extra step where you boil the dough in a bath of baking soda is what makes it pretzel bread, but don’t be alarmed by the extra step. It’s easy and kind of fun. After just 25 minutes in the oven, they were perfect. Also, anything that gets melted butter slathered on it right out of the oven can’t be bad. Having two small loaves is helpful for portion control, but it also makes this pretzel bread recipe perfect for gift giving. If you can part with one. My house smelled like that pretzel stand at the mall. It was awesome – and dangerous. In the bowl of a stand mixer or in a large bowl, combine the yeast, water, milk, brown sugar, and butter. Let the mixture rest for 10 minutes so the yeast come alive. Mix in the coarse salt, then the flour, one cup at a time. The dough will be tacky. Spray a large bowl with cooking spray or coat with oil. Transfer the dough to the bowl, flip to coat on both sides, and cover with plastic wrap for 30 minutes. After 30 minutes, knead the dough for 10 minutes until it is smooth and elastic. Return the dough to the bowl, flip to cover both sides, and re-cover for an hour, or until roughly doubled in size. Preheat the oven to 400 degrees and bring 4 quarts (16 cups) of water to a boil. Gently deflate the dough and cut in half using a sharp knife or bench scraper. Shape each half into a round loaf. Slowly add the 1/2 cup of baking soda to the boiling water (it will bubble). Place one piece of dough onto a large slotted spoon and gently lower into the boiling water. Use the spoon to flip the dough in the boiling water for around 20 seconds, then lift the dough out of the water with the slotted spoon – allow the excess water to drip back into the pot. Set the dough onto a greased baking sheet. Repeat the water bath with the remaining dough. Sprinkle both rounds with coarse salt, then slash an X on the top of each with a sharp knife so the bread can expand while it bakes. Bake for 20-25 minutes, rotating the sheet halfway through. Remove from the oven and brush with melted butter. Yum! On my trips to Germany, I also make sure to get some pretzel rolls or bread. Definitely my favorite, but before your post I had never seen a good recipe to recreate. Not to mention the cheddar grilled cheese is right up my alley too. Lovely post! Krista, I really think you will be happy with this recipe! If I am ever in Germany I will no doubt eat my weight in pretzel carbs! Oh Aimee this looks sooo good. I know what I want you to make the next time you come home! I will happily let you mess up my entire kitchen too…. as I was reading this I just kept saying “what what what what what?? ?” in my head. I am so doing this. On a day that I am home alone. And don’t need to share!! 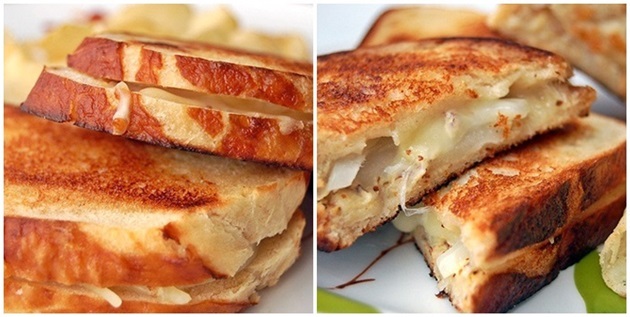 That grilled cheese looks crazy good! The sandwich in that glorious cheese looks fantastic. 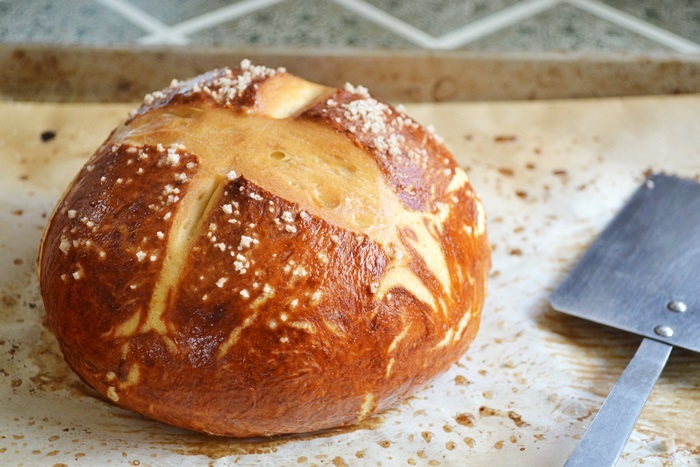 I love pretzel bread, but have yet to make it myself. I love pretzles too! and to think you can transform it in to bread for sandwiches is amazing. Oh man, I definitely need to make this ASAP. Even in it’s day old state, it looks awesome. I won’t blame the bread, ha ha.. the pictures still came out great the next morning. …Wait, you were able to wait til the next morning to eat it?? 😉 I’m ‘pinning’ this and will make it soon! omg i need this in my life!! Total yum! I have never heard of pretzel bread but as soft pretzels are a weakness (luckily they don’t sell them here in Edinburgh or I’d be the size of a house) this must be tried. Loving the over-blown pale ‘split’, just like on the smaller, original version. I think this would be fabulous torn and dipped in honey-mustard. the pretzel bread looks delicious, and I love your idea to make a grilled cheese out of it! I would maybe even add some grilled jalapenos (although I tend to add them to pretty much every sandwich or burger I eat) and another cheese to have more than one (provolone or jarlsberg?). yours looked so tasty I just might do it right now! I’ve got to make this sometime. My tummy’s rumbling just looking at it. 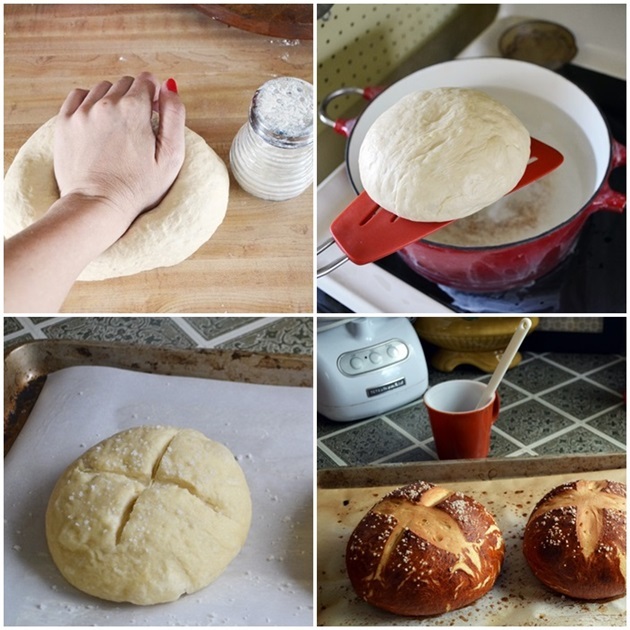 Just found your recipe (and blog) through Pinterest, and cannot wait to try this bread! All right, I’m doing it. I finally found an excuse to make this. Tomorrow afternoon, we’re having a bunch of people over for lunch. The menu: Roasted cheddar broccoli soup, PRETZEL BREAD, and a delightful honey peach sorbet to top it all off. I can’t wait! Well, Aimee, I made the pretzel bread. And I was lucky I was able to grab some of the crusts before it vanished. 🙂 We had 8 people over for lunch, and those two loaves of pretzel bread totally disappeared. It was SO good! Thank you thank you thank you for this post!!!! All the wonderful accolades I got from our guests today were SO gratifying, and I was so humbled and grateful to have had access to recipes like this to make people so enthusiastic about their food. Hannah, I am so delighted to hear that it was a success and that your guests enjoyed it! It is so humbling for ME to have someone make one of the recipes I post, and then share that it came out alright (phew!) – thanks for sharing and I hope you keep visiting! Yummy! I think I need to try this. I’m also a fan of soft pretzels. After all, they go so well with beer. 🙂 I also love Fort Meyers, FL. I spent a week there while in high school and have such fond memories. It’s always fun to bring back food memories from a good trip. This makes me want to cry with joy. Oh wow, this looks amazing! I have only just found your blog and this is the second recipe that I have bookmarked. I had better look up some excercise blogs straight away!! Do you think this would work in a bread machine? This is RIDICULOUS delicious. I’m not going to fit into myw edding dress if I keep making this. I just made this and it is sooo yummy! And it smelled so wonderful when it was baking in the oven. I followed the recipe exactly and came out perfect! Thanks for the great recipe! Is this one of those recipes that you can or cannot double straight off? There are some baking recipes that I never double because things don’t turn out the same….anybody doubled this one yet? IT was FANTASTIC when I made it with just the two loaves! Thanks in advance! brush the top of each pretzel with the beaten egg yolk and water mixture. It’ll give it a deeper color and crunchier crust. can this be made in a bread machine? 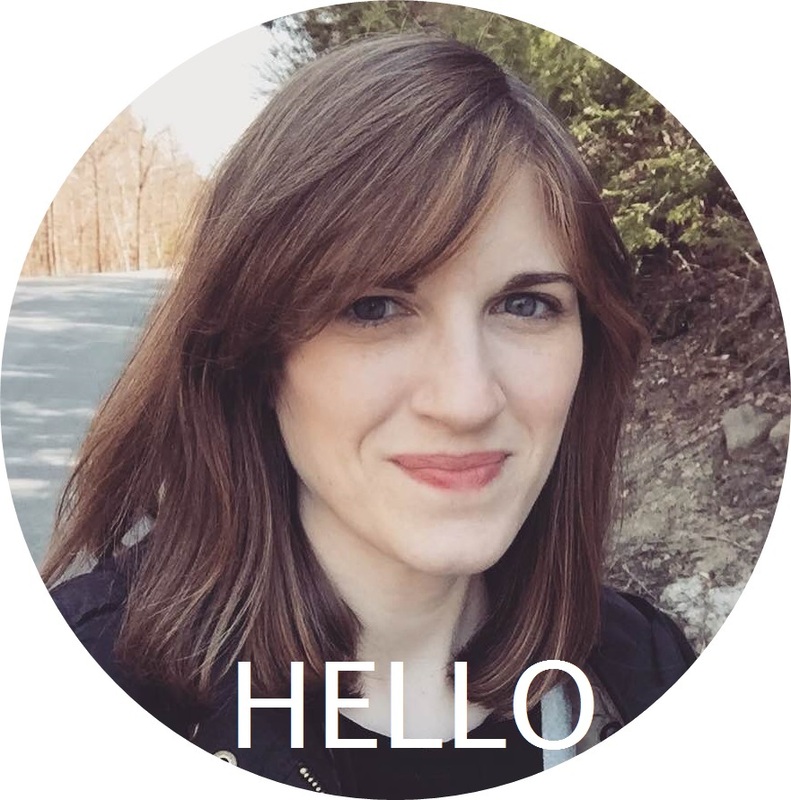 Hi Jacy – I’m not sure! I’ve never ventures into the world of bread machines, but if you try it, let us know how it came out! Thanks. 2013 is the year I start making bread, and I am starting with this!! Would you be so kind to tell me what exactly is “bread flour”, as I’m sure this must be critical to the taste and texture? I know this is probably a silly question but I’ve never made bread before. Do I need to use the dough hook when mixing or just the regular paddle? Does it make a difference? Can you freeze the second loaf and bake at a late time? This bread is pure evil!!! I really would like to try making this today. All I have is All Purpose Flour. Can I use that and get the same results?? Hi Jenna – the bread flour has a higher gluten content, so if you use AP it won’t rise as high, but should still come out fine. Let us know how it turns out! I just made this and it was awesome! It was also fairly easy which is great too! :). Thanks for sharing a wonderful recipe! I just made this bread and wanted to say thanks for a GREAT recipe! You made it super easy to follow along. I used regular AP flour for anyone reading, and it turned out great. YUM – this bread will be in regular rotation. Just made this tonight – I can’t normally make anything taste good and this tastes AMAZING! Thanks for the recipe! Hi Hajo, The dough has a small rise, then is kneaded before the long rise, then is shaped and boiled for 20 seconds before heading right to the oven. They’ll look a little funny before they go in, but the heat works its magic and they come out beautiful. It was so delicious, thank you so much, I have a happy family! As per the method (I found it first at http://www.simplysogood.com/2010/03/crusty-bread.html), I used rapid rise/bread machine yeast & decreased the amount to 1/2 tsp., increased the salt to 1.5 tsp. fine-crystal sea salt (the bath adds a saltiness, so I decreased that amount from the usual 1.75 tsp.) & increased the water to a scant 1.5 cups. I stirred the flour, yeast, salt, & brown sugar w/the water until it came together as a wet-ish dough (as is the par for the Dutch oven method), & then worked in the melted butter. Saran over the bowl, I left it on the counter for about 20 hrs. PS – I use King Arthur All Purpose, which has a high gluten content. I actually like it better than their bread flour. So glad I found this recipe – it’s our new favorite bread! It doubles easily and you get four delicious loaves instead of two!! Great for sharing!! Keep the dough tightly shaped in a round loaf as you drop in boiling water – otherwise it spreads and you get a flatter loaf!! Still delicious, but not nice and round!! You won’t be sorry you tried this!! I don’t know if anyone will see this comment. I’m making this now, and it’s in for its second raise. The recipe doesn’t mention extra flour for the kneading, so I didn’t add any. Is this correct?! I know the likelihood of you seeing this comment is slim, BUT I have seriously made this bread more times than I can remember. I double it every time and bake it in loaf pans so we can use it as sandwich bread. I made hamburger buns out of it, and tonight I made dinner rolls by following the recipe exactly except I skipped the baking soda water. Seriously we love this recipe. Kim, I am so glad! I love it, too! Keep on enjoying every bite! Excellent bread. My husband and I ate the entire first loaf for lunch. The bread texture is soft and flavorful. I would have liked to share the second loaf with a neighbor, but decided to save it for dinner instead. Thank you for sharing this recipe. 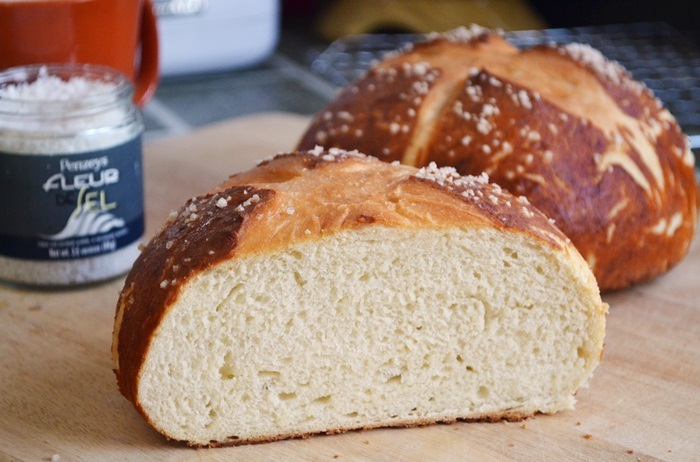 I love the process of making bread and this recipe is among my favorites. Made it with our Pasta E Fagioli last night and it was wonderful. The texture and flavor of this bread is amazing and the loaves lovely. The baking soda bath may be intimidating at first, but well worth the effort. I have an enamelware pot that I use for this very purpose when not storing Christmas cookies. 🙂 Instead of bread flour, I add a tablespoon of wheat gluten to my unbleached flour: 1 T. gluten per 3 cups unbleached flour. I found this on Pinterest a while back and I have been making it every since. I am so in love with it I am featuring your recipe (link provided) in my blog airing 2/1/16. It’s just to good not to share! I hope you don’t mind? Thanks for sharing this page full of greatness!! On my 7th time making this. Simply wonderful. Followed the instructions exactly. You are a master bread maker!!! Love this bread!. It has become our favorite bread served with soup, which is at least once a week this winter. It is delicious! I use unbleached flour instead of the recommended bread flour, since that is what I have on hand. However, I add 3 tsp. gluten when measuring the first cup of flour. The baking soda step was intimidating at first, but not anymore. I have a small, deep stock pot that is perfect for this step. I bake the loaves on stoneware cookie sheets. This recipe is worth the effort, it is so good!